To mark the 70th birthday of The Prince of Wales this year, the Summer Opening of Buckingham Palace (21 July – 30 September 2018) will include a special display of over 100 works of art personally selected by His Royal Highness. Having grown up surrounded by The Royal Collection, The Prince of Wales has enjoyed a life-long passion for art and, as Chairman of The Royal Collection Trust and Patron of several arts charities, has promoted the creation and understanding of art worldwide. In the exhibition Prince and Patron within the State Rooms at Buckingham Palace, a selection of the The Prince's favourite art works will be shown alongside works created by young artists supported by three of His Royal Highness's charities – The Royal Drawing School, The Prince's School of Traditional Arts and Turquoise Mountain. These charities were founded by The Prince of Wales to encourage the revival of dying arts and to maintain traditional skills for the benefit of artists and communities across the world. Among the works selected by The Prince from the Royal Collection is Johan Joseph Zoffany’s painting The Tribuna of the Uffizi, 1772–77, showing connoisseurs and Grand Tourists admiring the Grand Duke of Tuscany’s collection in the Uffizi, Florence. The artist was commissioned to paint the work by Queen Charlotte, consort of George III. 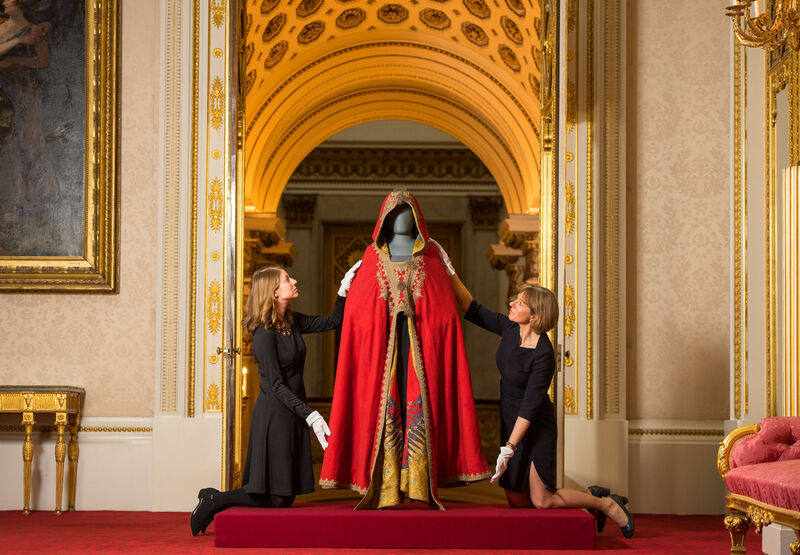 The cloak of Napoleon Bonaparte was chosen by His Royal Highness for the compelling story it tells. Made of felt and embroidered in silk, it was removed from the Emperor's baggage train in the aftermath of the Battle of Waterloo in 1815 and presented to the future George IV by Field Marshal Blücher, who fought alongside the Duke of Wellington. In 2000, The Prince of Wales founded the Royal Drawing School, an independent educational charity raising the standard and profile of observational drawing through teaching and practice. Exhibiting artists are graduates of The Royal Drawing School’s prestigious postgraduate programme, The Drawing Year. Works chosen by His Royal Highness include the ink drawing The Where That Was by Olivia Kemp, who reimagines Guernsey following time spent on the island as an Artist in Residence, and the watercolour The Church in the Mountains by Sophie Charalambous, inspired by the church of Panagia Phorbiotissa (Panagia of Asinou) in the Troodos Mountains, Cyprus. Founded by The Prince of Wales in 2004, The Prince’s School of Traditional Arts encourages the practice of traditional arts, including textiles, ceramics, calligraphy, stained glass and mosaics, and is now active in over 20 countries across five continents. Patterned tiles by student Ghulam Hyder Daudpota were inspired by motifs of Kashikari art, which can be traced back to the 12th-century shrine of Shah Yusuf Gardezi, Multan, in present day Pakistan. The tiles are handmade using natural red clay and painted with traditional colours and glazes. Natasha Mann's paintings based on Moroccan designs highlight the School's focus on geometry as a creative practice. Mann is influenced by the Zouaq technique, used to decorate ceilings, doors, furniture and wooden objects in Morocco. The highly complex patterns are initially drawn with a compass and ruler before being transferred to wood. The paintings are created using hand-ground natural pigments mixed with egg (egg tempera) and finished in 24-carat gold leaf. Founded in 2006, Turquoise Mountain creates jobs and skills while reviving traditional crafts in historic communities. The organisation has established sustainable urban regeneration projects that support the revival of creative industries in Afghanistan, Myanmar and the Middle East. The one-metre high geodesic dome, carved from walnut wood by Naseer Yasna (Mansouri), makes use of jali, the technique of creating geometric lattice designs from hundreds of individual pieces of wood. The dome is an example of how artisans are repurposing traditional forms and techniques to create contemporary objects. To find out more about visiting Buckingham Palace, please visit Royal Collection Trust's website.